These are my best BBQ chicken recipes, and will be your favorites too. Summer or not, you are going to LOVE these grilled chicken recipes. 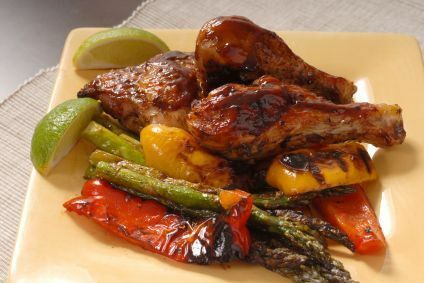 I offer my best chicken marinades and homemade barbecue sauce so your chicken will turn out juicy and flavorful every time. I am so excited to share these grilling ideas with you. Browse and bookmark this page - because you will be referring these chicken recipes often. Just a note - for those of you that cannot grill outdoors and use the George Foreman grilling machine, these recipes for grilling work just as well. The first of my best BBQ chicken recipes creates succulent, moist chicken. You and your family will love it. In a saucepan combine all ingredients (EXCEPT cornstarch and water), and bring to a boil while stirring over medium high heat. Then reduce heat and simmer for 15 minutes. In a small bowl combine the cornstarch and water and whisk until smooth. SLOWLY add to the simmering glaze and stir until mixed. Cook stirring constantly on medium high heat until glaze thickens; approximately 5 minutes. If you prefer your glaze thicker, make another batch of cornstarch and water and use 1/2 of that. Spray your grill grates with Pam or any other vegetable oil spray and grill the chicken until almost done (juices run clear). Top the grilled chicken with the maple syrup glaze and close the lid on the grill to heat the sauce. If you prefer to grill the chicken coated in the sauce that is fine also. Serve. Here's another one of my best BBQ chicken recipes that will have your friends and family begging you for. The hot pepper sauce is optional, or use according to your own personal taste. In a saucepan over medium heat, melt the butter and sauté the garlic. Add the remaining ingredients and bring to a slow boil; remove from heat. Prepare your grill by cleaning and spraying the grates with vegetable oil and setting to medium heat. Slowly grill the chicken so it remains juicy, and mop with barbecue sauce 15 minutes before it's done. Turn chicken often and baste with more barbecue sauce. Just be certain to check out my easy chicken marinades to enhance the flavor of the poultry, meat or fish. Also check the marinating times - many are for a few hours; and some are overnight. I've also included my favorite homemade barbecue sauce recipes. Impress your family and friends with tangy, sweet or spicy barbecue chicken today. The next one of my best BBQ chicken recipes is this wonderful chicken wing recipe. If you are a wing lover than you will love these. They will give you sweetness, zing and as much kick as you desire. Combine all ingredients in a gallon sized resealable bag and shake to combine. Add the chicken wings and refrigerate 24 hours. Preheat your grill to medium heat and spray the grates with vegetable oil. Drain the marinade from the wings and discard. Cook the wings on the grill turning occasionally, until juices run clear - 25 to 30 minutes. 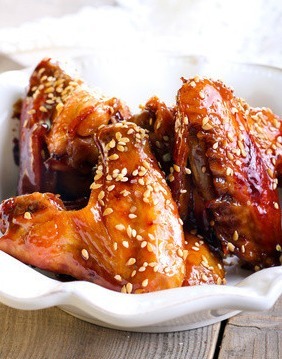 The next one of my best BBQ chicken recipes is this awesome grilled Asian wings recipe. Grilled chicken wings at it's finest; I must say. The grilling sauce is bursting with flavor and not only is it great for wings - try it with pot-stickers, fried mushrooms and even a dipping sauce for grilled steak or shrimp. (I've even used this for a salad dressing.) I guarantee this will become a family favorite. Spray grill grates with vegetable oil and cook wings on medium heat, turning occasionally, for 25 to 30 minutes until done - or juices run clear. It's time to make the sauce. In a pan over medium heat, add the two tablespoons of canola oil and add the ginger. Cook for 3 minutes. Next add the remaining sauce ingredients and mix well. Simmer the sauce for 15 minutes on low heat, stirring occasionally. you need to thicken the sauce, use a combination of cornstarch and water. Add slowly and mix well. Raise the heat so the sauce comes to a slow boil and when it does, remove from heat. Bring in your grilled chicken wings and add to the sauce. Garnish with scallions and sesame seeds.